If you don't see your question here, ask us with the Contact Us Form. What is iSeeMammals and its purpose? I don't live in an area with bears. Can I still participate? What kind of data does iSeeMammals collect? Why do you ask for GPS/Location Services? Are there fixed cameras you recommend? How can I know what I saw was bear sign? How many bears are in New York? Are there really more bears in New York now? Why? Bears are damaging my birdfeeders. What can I do? I've forgotten my password. How do I retrieve/change it? How do I un/subscribe to iSeeMammals? iSeeMammals is a new citizen science project designed to document and study wildlife mammals across wide regions by collecting information from observations, hikes, and fixed cameras. Started in 2016, iSeeMammals is focusing on black bears in New York for its pilot project. The purpose of the black bear project is to collect data using citizen science to study the distribution and occupancy of black bears across New York State. The data from iSeeMammals will supplement datasets that researchers are collecting, incluidng GPS data from individual bears with GPS collars, winter den visits of collared bears, and DNA from barbed wire research sites, and harvested bears. These data will go into a model to estimate population size and demographic rates, including population growth, survival, and reproductive rates. This will help researchers and management better understand how the population of bears is changing. We hope citizen science can be a sustainable, long-term method for helping to monitor the changing distribution of bears as their numbers grow in New York. Anyone can become a citizen scientist and be a part of iSeeMammals. Create an iSeeMammals account (link here), and download the app onto your smartphone. Use the website and the smartphone app to submit data. Use the app when you go on a hike or set up a trail camera. You can also use the app to take pictures of bears and bear signs to submi them as observations. Creating an account allows citizen scientists to keep track of submissions. You'll be on your way to being a part of wildlife research when you take iSeeMammals with you outdoors! Absolutely! ISeeMammals is interested in where people do not see bears too! If you spend time outdoors in nature, then you can be a citizen scientist for iSeeMammals. iSeeMammals is for outdoor and nature enthusiasts: people who like hunting, hiking, visiting state parks or forests, and many other outdoor activities. You can also help by spreading the word to your friends, neighbors, and community members. Cat Sun is a PhD student in the Department of Natural Resources at Cornell University. She has developed iSeeMammals as part of her graduate research on black bears in New York. She manages the project and data. This work is a collaboration between Cornell University, the New York State Department of Environmental Conservation (NYSDEC, the state agency that manages the bear population in New York), and the New York Cooperative Fish and Wildlife Research Unit (NYCFWRU). The NYCFWRU is a partnership between the US Geological Survey, the NYSDEC, and Cornell University. What kind of data does iSeeMammal collect? iSeeMammals collects data on the presence and absence of bears, through "detection/non-detection data". Detection data refers to when a citizen scientist sees a bear or bear sign, as a one-off event, as part of a hike, or from a fixed trail camera. Photographs are strongly encouraged - they're not only fun but useful for confirming observations! Non-detection data is when bears or bear signs are not detected. Detection and non-detection data are both necessary in order to accurately study bears. iSeeMammals also needs to know where and when citizen scientists collect this information. This is why iSeeMammals retrieves the GPS and timestamps from your photos and fixed camera. Questions like "How many people were in your hiking group" and "What is the brand of the fixed camera" allow researchers to look at the data in different ways. Why does iSeeMammals require GPS/Location Services? Fixed cameras are cameras placed in an outdoor fixed location to collect photos when it is triggered. They are commonly called trail cameras, game cameras, or camera traps. iSeeMammals calls these cameras "fixed" to avoid confusion with taking photos with cameras when on hiking on trails. Fixed/trail/game cameras are used to see what wildlife are in the area - making them perfect for collectind data about wildlife! Use the app when setting up a fixed camera to get the GPS location and start the camera's history log. Then use website to submit photos from the camera. There are a lot of different cameras on the market, and the technology keeps improving. Cameras typically range between $100- $700, especially after including accessories (batteries, SD memory cards, cable locks, metal boxes). Most lines of cameras excel at a few features, so it's important to know what you want from a camera. In our New York research, we find that Bushnell Tropy Cams are a fair compromise between price, function, and quality. Some things to take into consideration are whether you prefer video or pictures, what kind of night pictures you want (color/no color, level of grain, etc), the trigger speed, range of detection, and if you want it to have WiFi or Cell Service capabilities. Visit our Tips page to see our recommendations for setting up a camera. Sometimes bear sign can look like it's from another animal (deer, dog, or other large mammal). Check out our page here for guidance. There is also an abbreviated version on the mobile app. When submitting observations, including a photo so the researchers to take a second look at it. How may bears are in New York? There are an estimated minimum of 6,000-8,000 black bears in New York, according to the New York State Department of Environmental Conservation (NYSDEC). The Adirondacks, which makes up most of the Northern Zone, has approximately 3,200 bears; the Catskill region has approximately 1,800 bears and central-western New York has about 1,000. Together the Catskill and central-western regions make up the Southern Black Bear Zone. However, the exact population size and the distribution of bears across the state is unknown. The bear population in New York has been growing since the 1950's. This is due to several reasons: 1) In 1903, New York began protecting bears from unregulated hunting; 2) Amount of forest, which are a traditional habitat for bears, has been increasing because many farmlands are reverting back to forest; 3) Bears are also very adaptable species, and can live in even highly human-altered landscapes. As the number of bears increase, their range in New York has also grown. 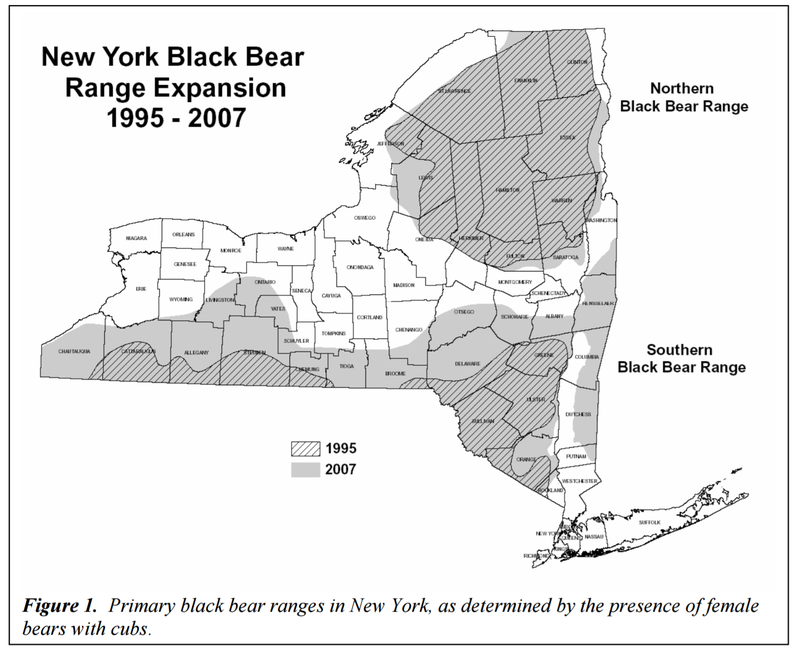 Below is a map of how the bear range in New York has expanded since the mid-1990s. As their numbers grow and range expands, bears are coming in more frequent and intense contact with people. This includes not only opportunities for sightings, but also harvest, property damage, and vehicle collisions. For these reasons, it is important to study bears and estimate their population size and distribution. From NYSDEC "Black Bears in New York: Natural History, Range, And Interactions with People"
When bears come out of their dens, they are searching for food to replenish their energy. Similarly in the fall, bears are searching for food to prepare for overwintering. (Technically bears do not "hibernate" because they may awaken and temporarily resume activity). During spring and fall, birdfeeders provide concentrated amounts of high-quality food. Records of nuisance complaints show that birdfeeders around homes account for 80% of nuisance complaints during certain times of the year! To protect birdfeeders from bear damage, the New York State Department of Environmental Conservation suggests that birdfeeders be put out only from Nov 30 - April 1, when bears are in their dens. Go to the Log in Page, and you will find a "Forgot your Password?" link to retrieve your password. You can directly access that here. After logging in, find your name in the top right of the website. Click on your name and choose "My account". At the bottom of the page is a checkbox for the mailing list. Check the box to subscribe; uncheck the box to un-subscribe. I'm giving you GPS data. That's sensitive information! We understand and respect your privacy. Therefore, while we need exact GPS locations to accurately estimate the occurrence and distribution of wildlife, results will only be reported at a coarse spatial level, such as regional, in order to inform wildlife management. The data are held in a secure database, and used and accessed only by the researchers. Account information and GPS locations will never be shared with other parties. At times, researchers may want to share a particular citizen scientist's photo. In those cases, permission from the citizen scientist is requested. At the citizen scientist's preference, general location may be included.